Spinning Plates is NOW on Sale! After a successful three month theatrical run, Spinning Plates is NOW AVAILABLE on iTunes, Amazon and others! Grab your digital copy now! 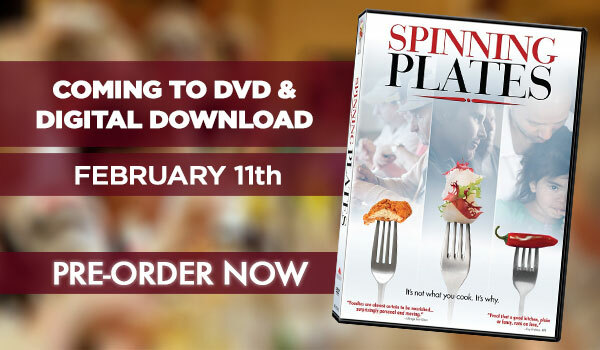 Spinning Plates is Coming to DVD and Digital Download on Feb 11th! Director Joseph Levy appears on "The Morning Show"
Spinning Plates opens tomorrow at TIFF Bell Lightbox theater! Check the schedule for more information. Spinning Plates opens TODAY in Denver, Minneapolis, and Seattle! Gather your family & friends, and share the film that the Los Angeles Times called a "foodie phantasmagoria and something more...an involving look at personal dramas that go well beyond the kitchen." And if you’re in San Francisco, Berkeley, or San Diego, be sure to come back for seconds! Tickets for all cities are available NOW! We're thrilled to announce that Spinning Plates is expanding into Pasadena, Encino, and Phoenix THIS WEEKEND! Get your tickets early! We're also happy to be continuing our runs in Chicago, Los Angeles, and New York. Tickets for all these cities are available now! Subscribe to the Spinning Plates Newsletter to be notified of schedule changes, special screenings, live events and more!